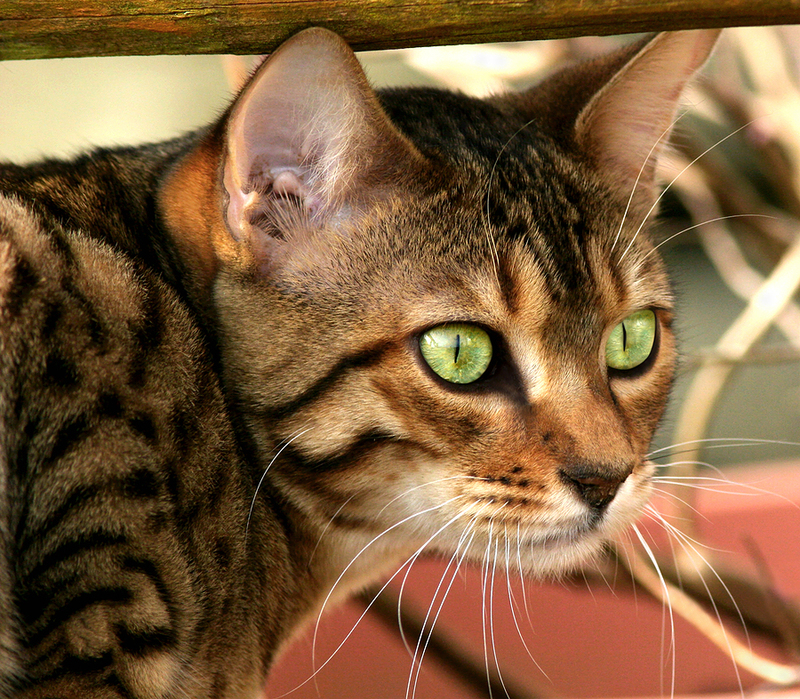 The Bengal is a relatively new hybrid breed of cat, formed by the cross of an Asian Leopard Cat ("ALC") and a domestic feline such as an Abyssinan, American Shorthair, Burmese, or Egyptian Mau. 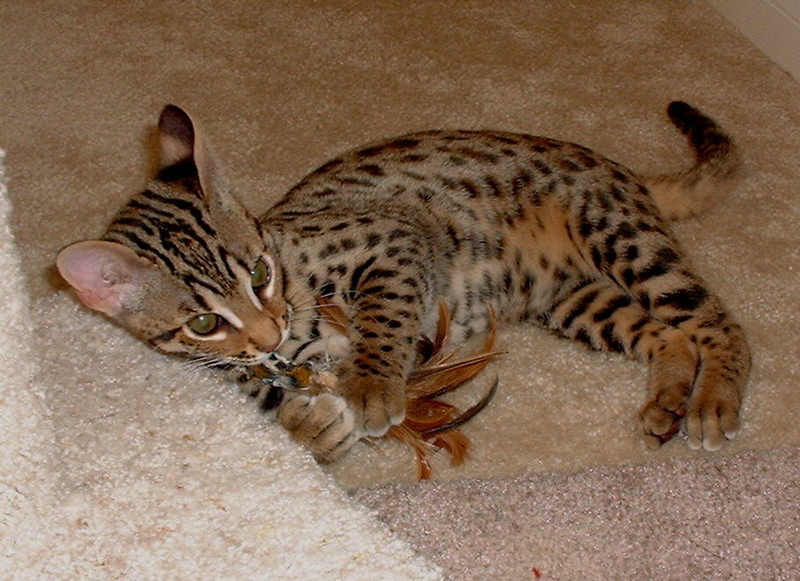 The first Bengal Cats were bred in 1963 by Jean Sugden Mills; and later in 1972, with eight female ALC-domestic offspring she acquired from the University of Calfornia. The name Bengal cat was derived from the taxonomic name of the Asian Leopard Cat (P. b. bengalensis), and not from the unrelated Bengal tiger. The Bengal is a medium to large, sleek and well muscled cat, with rakish hindquarters slightly higher than shoulders. Female Bengals average from 7 to 11 pounds at maturity, and males can average from 11 to 18 pounds at full growth. 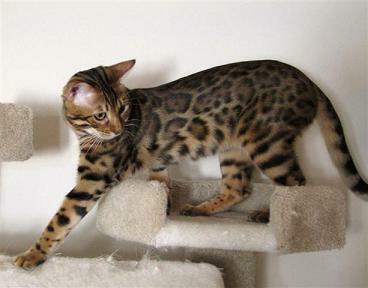 The Bengal coat is short and dense, with a soft and silky feel, patterned in random spots or marbled, with a variety of acceptable colors. The coat may be "glittered," which is an effect that appears as if it were sprinkled with glitter. To belie its wild background, a Bengal is described as lively, playful, affectionate, and intelligent. Bengals love water, and will splash in the sink, or even jump into the shower with you. 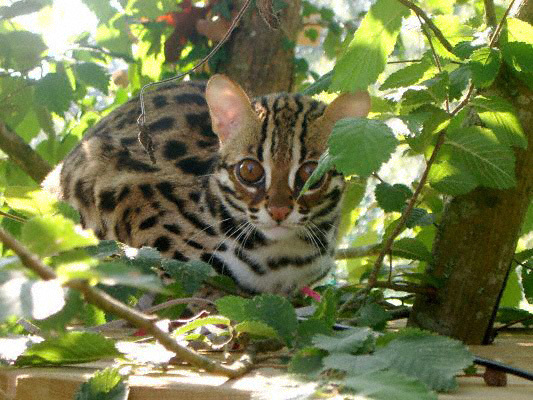 The Bengal combines the exotic look and feel of the small forest-dwelling wild cats they descend from with the dependability and loving temperament of the domestic cat. For a walk on the wild side with an affectionate companion, you can't go wrong with a Bengal. 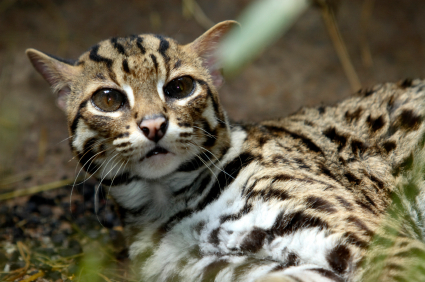 The Leopard Cat has the widest geographic distribution of all felines. It can be found in forest areas throughout Indonesia, Philippines, Borneo, Malaysia, Singapore, Thailand, Myanmar, Laos, Cambodia, China and Taiwan. The cat also can be found in Korea, Bangladesh, India, and Pakistan. Their range of habitat is varied, and includes tropical forest, scrubland, pine forest, second-growth woodland, semi-desert, and agricultural regions, especially near water sources; they may also be found at heights up to 3000 m.